2. Fry the onions, garlic, ginger and red chillies till onion is soft. 3. Add all the powdered spices, star anise and fry for a minute. 4. 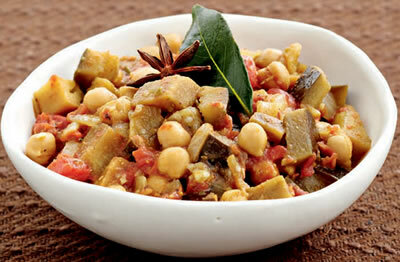 Add the chopped brinjals, coconut milk, tomatoes and chickpeas. 5. Cover the pan with a lid and let it simmer for 30 minutes. 6. Cook till it is thick and saucy. 7. Add salt and pepper powder. Feel free to comment or share your thoughts on this Brinjal and Chickpea Curry Recipe from Awesome Cuisine.